Enjoy protection from the sun's harmful rays and keep out pesky insects with Zip Tex motorized roll up screens. Spanning up to 19 ft. wide and 16 ft, tall, virtually any opening can be accommodated. 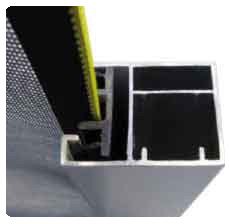 Any type of establishment can benefit from our residential, commercial and recessed applications. Extruded aluminum components and stainless steel fasteners ensure receiving the highest quality product. Insect, solar and privacy mesh along with a variety of popular colors make it easy to offer motorized units that are customized to fit all needs. The Zip Tex screen rolls into a small, virtually unnoticeable housing when not in use and simply rolls down when you need protection. What separates the Zip Tex from the standard Solar Tex is the Zip Tex End Retention System. A small coil style zipper is the key component of this end retention system, providing a smooth, quiet operation with no binding or bunching of the roll. The Zip Tex End Retention System secures the screen in the tracks, firmly eliminating those pesky bugs from finding their way in. This feature also ensures total shading coverage track to track. Insect screen offers the ultimate in insect protection, while at the same time stopping up to 65% of the sun's heat and glare. This fabric improves daytime privacy and offers excellent outward visibility, yet openness of the 20x30 mesh is small enough to keep out tiny insects. Solar Mesh is a unique woven mesh that can block 75-90% of the sun's hot rays before they enter your windows, while also performing as an insect screen. This fabrics primary purpose is to reduce solar heat gain in the summer and reduce heat loss in the winter. Privacy Mesh is the ultimate in shading protection by blocking up to 90% of the sun's heat and glare before it penetrates windows and doors. 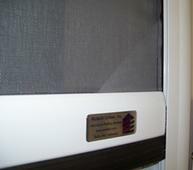 This fabric improves daytime privacy while offering outward visibility. Ideal for extremely hot windows, doors and porches.